I’m calling this hippie horror show “The Silence of the Vans.” If Buffalo Bill and Leatherface attended Gathering of the Juggalos, they would drive this. There is absolutely nothing warm and fuzzy about this trip down memory lane, just straight up “I like my beer cold, my weed strong, and my women skinned alive.” Make sure you watch the videos. Amazing! 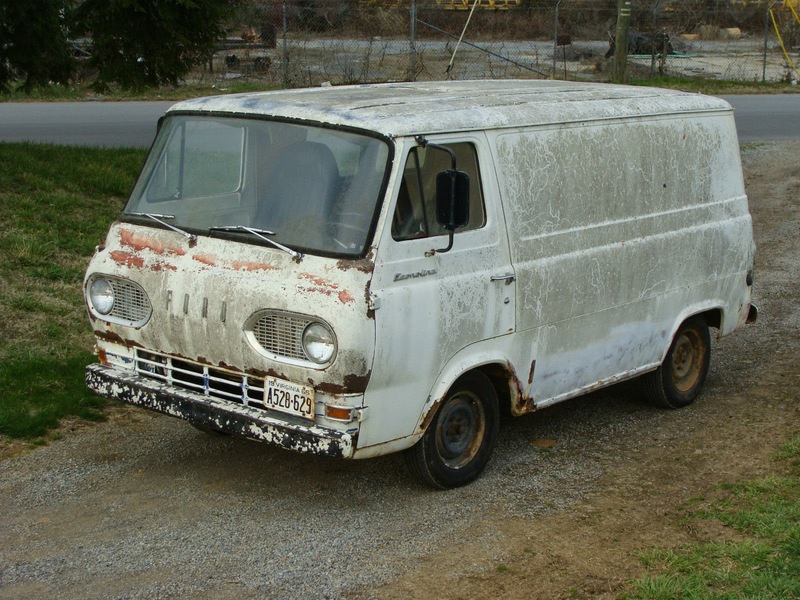 Find this 1965 Ford E-Series Van here on eBay currently bidding for $1,576 reserve-not-met with 2 days to go, located in Roanoke, VA.
First impression is wow. The exterior of the body looks like flooring after you've pulled up carpet that had been glued on top of linoleum for 20 years. Here is the shocking part...that's nothing compared to the inside. Hey! 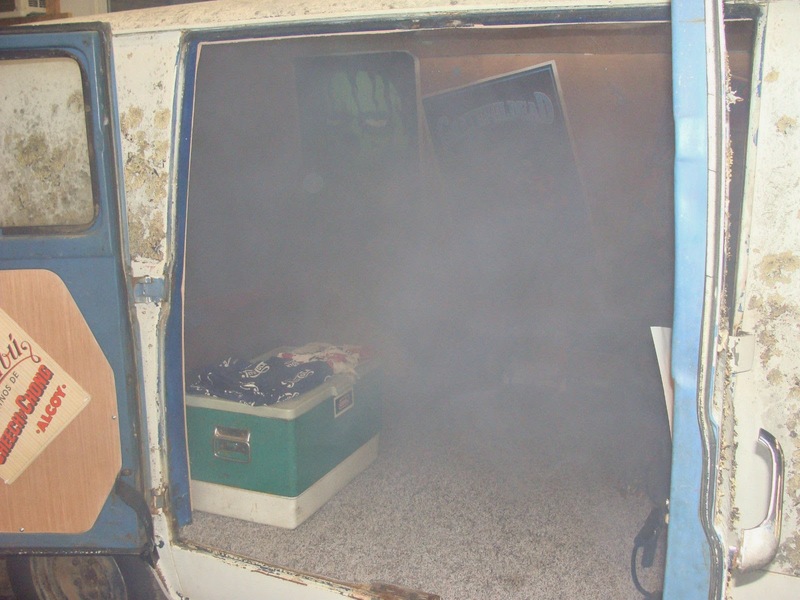 Quick, somebody call 911, the van is on fire! No. It isn't actually on fire -- that is either the smoke machine or heavy use of the bong prominently featured in the pictures. Guys...doncha know the feds look at eBay too? Don't be surprised if some boys in blue show up to take a closer look at your garage after the auction closes. At first look it appears the exhaust is routed into the cabin -- perhaps as a makeshift heater or impromptu Thanatron/Mercitron -- but this is the smoke machine filling the cabin with fake smoke. See another van like this? Don't send it to me! By the time you get done dipping or media-blasting it none of that will matter. Of course, that implies a willingness to put at least $8-10K (by the time you're done with reasonable paint) into the cosmetic refurbishing. pun intended - "trip" down memory lane? This is a marketing home-run for one of the gazillion weed shops now legal here in CO. Paint a giant leaf on the outside, drive it to Denver and let the bidding begin. Love the color listing on ebay - White/Mossy. I think I would have to seal this up in a bio-hazard bag and drop in a proper receptacle. If this van could only talk...it would probably forget what it was going to say. It'd probably ask if you've got any Cheetohs. Cheech and Chong did it better ! This would be perfect TO LIVE IN DOWN BY THE RIVER. From the listing copy, I thought this van would have some kind of magical 'tiny house' gypsy interior protected by its junky outer appearance. But that video of it rocking under the tree with smoke pouring out the windows is soooo creepy! I think the seller's desired impression is of a stoner couple inside knocking boots, but it looks more like a crime in progress. Could you imagine showing up for a date in this thing? Something tells me that no actual females would come near this vehicle unless they were bound with duct tape.